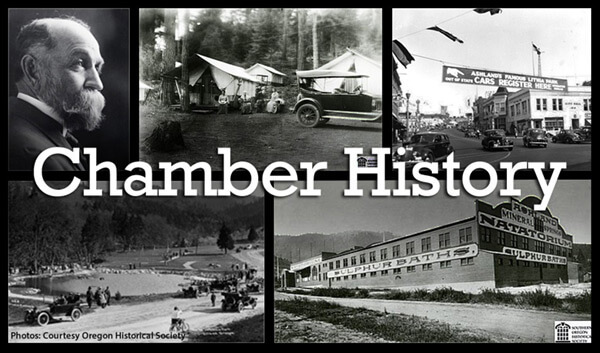 Historically grounded since 1889, the Chamber, formerly the Ashland Board of Trade and Ashland Commercial Club, promotes business and tourism, creates events, maintains strong community partnerships and collaboratively solves problems through strong community leadership. The Ashland Board of Trade met with the newly elected city council and mayor in December 1891 and agreed to petition to reserve the Ashland Watershed. The petition delivered to President Cleveland requested that a forest reserve be set aside on Ashland Creek from the public land to protect the water supply from “timber land speculators and other types of vandals”. The proclamation for the Ashland Forest Reserve came in September 1893 with the express purpose of protecting the municipal watershed. Chandler Bruer (C.B.) Watson, President of the Ashland Commercial Club, orchestrated the protection of “Ashland Canyon Park” by enlisting the political support of the Commercial Club. He helped the Club see the benefits of “boosting” tourism by converting industrial mill lands into a park. This effort exemplified the City Beautiful movement, converting blunt frontier utility to more aesthetically pleasing and cultured presentation, an ethic especially appealing to the women of town. Alongside his wife, Ella J. Chitwood Watson, he assisted at the organizational meeting of the Ashland Woman’s Civic Improvement Club, where he shared his vision for a grand park, extending along Ashland Creek from the town’s Plaza eight miles up to the summit of Ashland Butte (present day Mt. 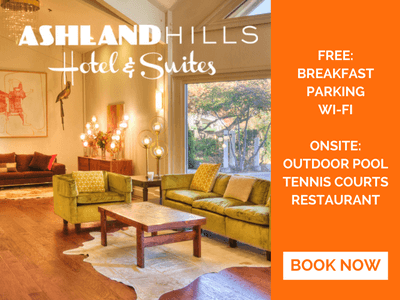 Ashland – a name change promoted by the Ashland Commercial Club to add ‘grandeur’). At the Commercial Club, Watson gave his “well-known and pronounced views favoring every movement that will enhance the beauty of Ashland’s natural surroundings”, and the Club passed a resolution to establish the Ashland Canyon Park. The City Council rejected the Club proposal, opting instead to sell the industrial land keeping a postage stamp-sized park. Leaders of the Commercial Club gathered signatures from amongst themselves and neighbors to successfully place the initiative on the December 1908 ballot. Between the combined efforts of the Commercial Club and the Woman’s Civic Improvement Club, voter support was assured, and the initiative passed by a famously wide margin. The City Beautiful Movement was further embraced by the Chamber. As time went on, every effort to beautify Ashland was either led by or supported by the Chamber such as when the Chamber worked to get rid of the dirt streets in the downtown by encouraging the paving of Main Street. Efforts were instituted to revitalize the downtown through economic downturns when passenger rail service ended and in the post-depression years. In the 1950’s, the Chamber began clean-up, fix-up, paint-up campaigns to beautify the town. Included in this effort were the first street trees in the downtown core started by former Chamber President, Dave Fortmiller, who owned and operated Fortmiller’s Department Store. The banners for the Oregon Shakespeare Festival were repaired and new Christmas decorations were purchased and installed. 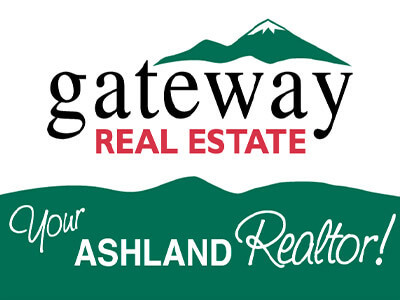 Community enhancement continues to be at the forefront of Chamber efforts with annual campaigns to raise money for decorations and close work with the City of Ashland to beautify the town instilling civic pride and visitor amenities. The Chamber began creating promotional literature in the early 1900’s encouraging visitors and new residents to come to Ashland through a variety of campaigns that continue today to showcase our beautiful town. “Where the Palm and the Pine Meet” promoted the mild climate in the early 1900’s and “Ashland Grows while Lithia Flows” encouraged people to come to Ashland for the health of its waters. Ashland’s agriculture and, in particular, the fruit grown here was promoted to encourage people to move here and grow peaches, pears and apples. 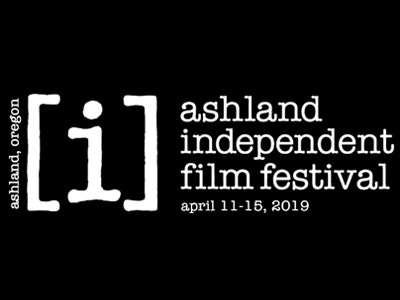 Campaigns and themes continue today that focus on Ashland as a destination for health and wellness, mild climate, exceptional produce, culinary offerings, beautiful surroundings, outdoor adventures and warm hospitality. 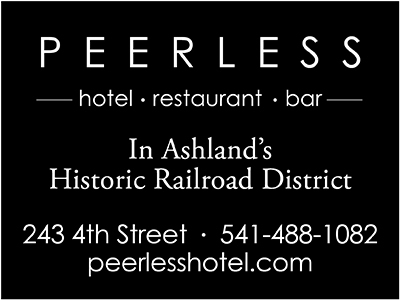 While always working to promote tourism, it wasn't until 1982 that the Chamber was able to formalize a Visitor and Convention Bureau with an annual grant from the City of Ashland which they continue to have today to promote the community. Those early “pioneers” of promoting Ashland recognized the economic importance of showcasing our community to potential visitors, thereby, not only promoting business, but increasing tax revenues and expanding the amenities that residents enjoy as well. 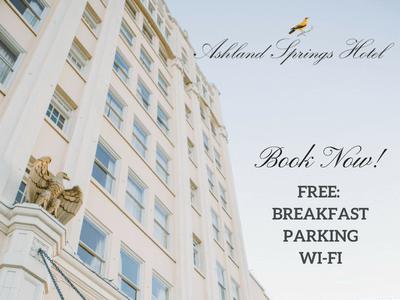 As early as the late 1800’s, event coordination and promotion has existed with the Ashland Chamber. The longest standing events being the 4th of July and celebrations during the Christmas holidays –now called the Festival of Light. 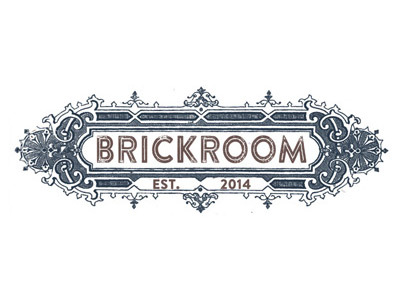 Mention is made in newspaper stories and minutes as far back as the late 1880’s of community celebrations coordinated by the Chamber which has allowed them to grow and develop over the years. Ashland has always liked a parade. Even when the streets were dirt in the downtown, they raced horses to celebrate the 4th of July and had a parade. Today, the celebration begins with a run organized by the Ashland Parks & Recreation Department, followed by a parade enjoyed by an estimated 20,000 spectators. After the parade is concluded, over one hundred booths in Lithia Park feature food, crafts and games while bands, including the Ashland City Band perform all day at the Butler Band shell. Spectacular fireworks and a performance by the American Band College on the Ashland High School campus conclude the day. For more information on the American Band College and tickets, visit bandworld.org/ABC. During the holidays, there was always a decorated tree on the Plaza and the community gathered with food and song. Today, the event begins the day after Thanksgiving to kick off the holiday season with Plaza entertainment followed by Santa’s parade at 5:00 pm and a Grand Illumination with a countdown led by Santa who officially turns on over one million lights all downtown. The town is lit until just after New Year’s. The Festival of Light celebrating the 26th year in 2018 has grown to include throughout December celebrating the magic of the season showcasing the charm and delight of seasonal events, shopping, dining and staying in a small picturesque town for the holidays. Hundreds of volunteers plan both events. Their dedication to the Chamber and community of Ashland is apparent whether they are coordinating the long line of 4th of July parade entries, the craft and food booths or bands in Lithia Park, or attaching garland to holiday decorations, these hardworking volunteers are truly committed to the spirit that is Ashland. This small town enjoyment by the community is treasured still by those who live here today.